Eliminate trips to the post office and the inconvenience it takes to manuallyprocess mail with the ultimail series of efficient postage machines. 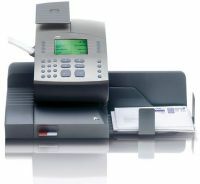 Easy to operate the ultimail 65 and the ultimail 120 will make the daily mail routine fast and efficient. The ultimail 65 handles 65 letters per minute with 300 dpi postage printing and the ultimail 120 handles 120 pieces per minute. Equip the ultimail 65 with a semi-automatic feeder or choose the fully automatic feeder for the fastest and easiest processing. The ultimail series meets all of Canada Post's security and processing standards to ensure that your have the best processing for all of your mail. Use the up to 5kg scale to ensure that all of your mail has the correct postage for fast delivery.